Giant, 'Extremely Dangerous' Waves Crash Into California Coast The National Weather Service warns of "potentially life-threatening conditions" from strong rip currents and powerful waves. A surfer rides a wave at Mavericks off Half Moon Bay, Calif., on Monday. 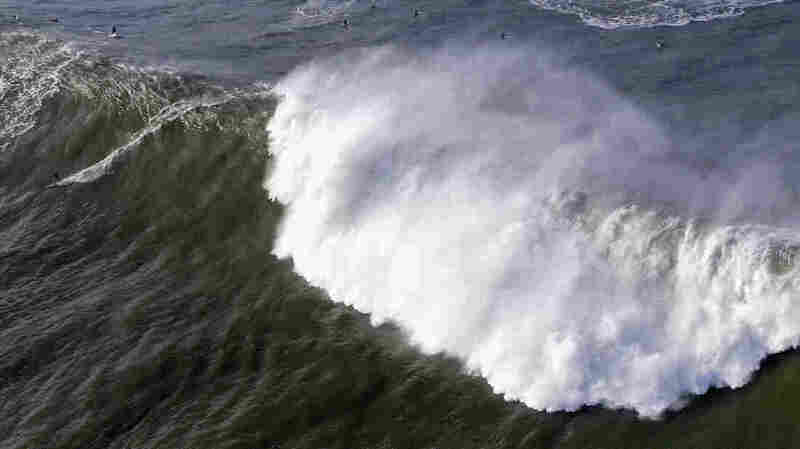 The NWS warned of waves that could reach "50+ feet at favored breaks" in Northern California. Massive waves are breaking along the coast of California, and the National Weather Service is warning of "potentially life-threatening conditions" and urging people to stay away from the water. Forecasters began warning of high waves over the weekend, saying a swell would strike Sunday afternoon through Tuesday, with the peak on Monday morning. The NWS warned of waves that could reach "50+ feet at favored breaks." As of Tuesday morning, the surf in Los Angeles was at 16 to 22 feet, the weather service says, while San Francisco was seeing breakers of 15 to 25 feet. The waves are so dangerous that the NWS isn't just telling people to stay out of the water — it's warning them to back away from the beach completely. "Sneaker waves may suddenly wash over previously dry sand or rocks, sweeping you into the water," the NWS Oxnard warned residents in Southern California. "There is a threat of significant beach erosion and possible damage to piers and coastal structures." The Ventura Pier has closed for the first time in several years, after it lost a pile and bracing to the waves. "STAY WELL BACK FROM THE OCEAN OR RISK CERTAIN DEATH," the NWS Bay Area tweeted. The annual Mavericks Challenge surfing competition off Half Moon Bay, Calif., has been called off, and organizers expect to reschedule it for January. The competition takes place only when conditions allow, and some years it has not been held at all.